We are currently at the forefront of the fight for equality, for the right to exist. By sharing our stories of struggles and obstacles, by being visible; not only are we writing history, we are creating it to be shared in the future by our future. I believe in and have fought for an America that was built on diversity, where everyone is treated with dignity and respect regardless of who they love, what they identify as, or how they pray. Now more than ever is it imperative that we tell our stories, that we are heard and seen, that we empower the language and the voices that we uplift, that we remain visible and provide the representation for the world that we want to create and live in. My decision to be visible is the reality that I choose, not one that can be chosen. My existence cannot be erased. I won’t let it. I wish the slogan for this revolution were “NeverBeErased” because the transgender community will never be erased. It’s impossible to erase this beautiful and vibrant community. There’s too many of us and, more importantly, there are too many of us that are visible and dedicated to remaining visible no matter what. Trans people have existed forever before there was terminology to identify with before there were any laws to protect us. We will continue to exist no matter what. Times may be rough for us, but we are resilient and we will continue to march on. We will continue to change things for the better. #WontBeErased means to me that no matter what anyone says or what anyone does I’ve been here … and I’m not going anywhere. Regardless of how much hate or injustice you throw at me, you’ll never be able to break me. You’ll never be able to make me feel like my life isn’t worth living, or I’m not deserving of love, kindness, and respect. 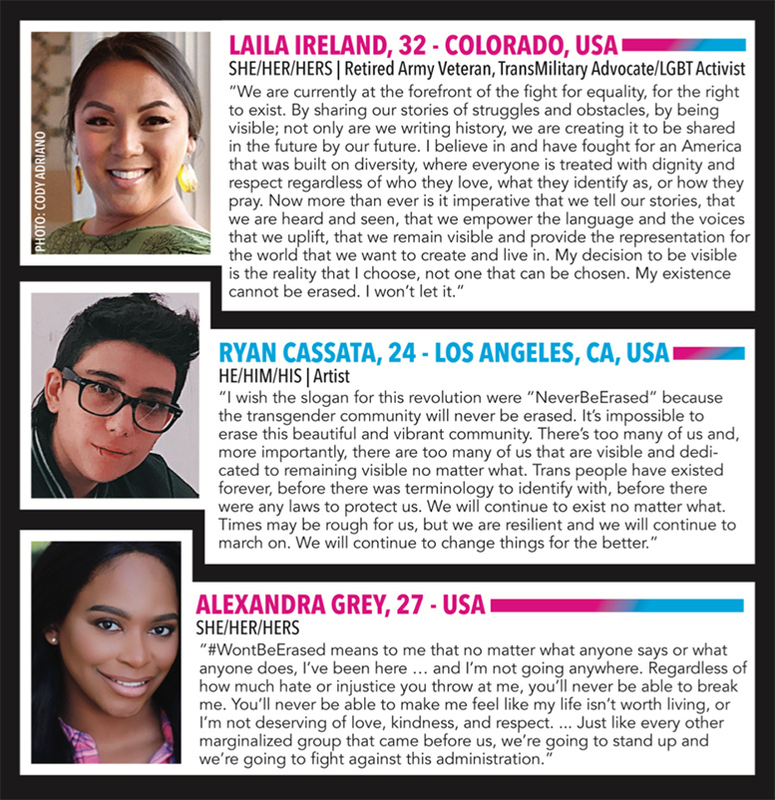 Won’t be erased means to me that just like every other marginalized group that came before us, we’re going to stand up and we’re going to fight against this administration and all of those other people who think that trans life is a joke. We deserve the same freedoms and liberties like every other citizen on this planet. How does my life and me living my truth affect your life in any way for you to feel that the world would be a better place without me? So when I say I cannot be erased, it’s exactly what it says. We are too proud of a people, we are too beautiful, we are too talented, and we have too much to pour into this world for our existence to ever be erased. My message to this administration is fairly simple: Get on the right side of history, do better and be better because, if not, you’re going to be in for one hell of a fight. If I know my community, I know that we’ve always been a people to band together and fight for our rights. It’s 2018 and we need to do better. The #WontBeErased movement means to stand my ground and to continue living who I am unapologetically. I am Izaac and I happen to be a trans male and I will be one for the rest of my life. To me, #WontBeErased means that I deserve rights and also to be recognized as who I am, as much as anyone else. I want to tell the administration that Trans people have always existed and always will, no matter how hard they try to erase us. 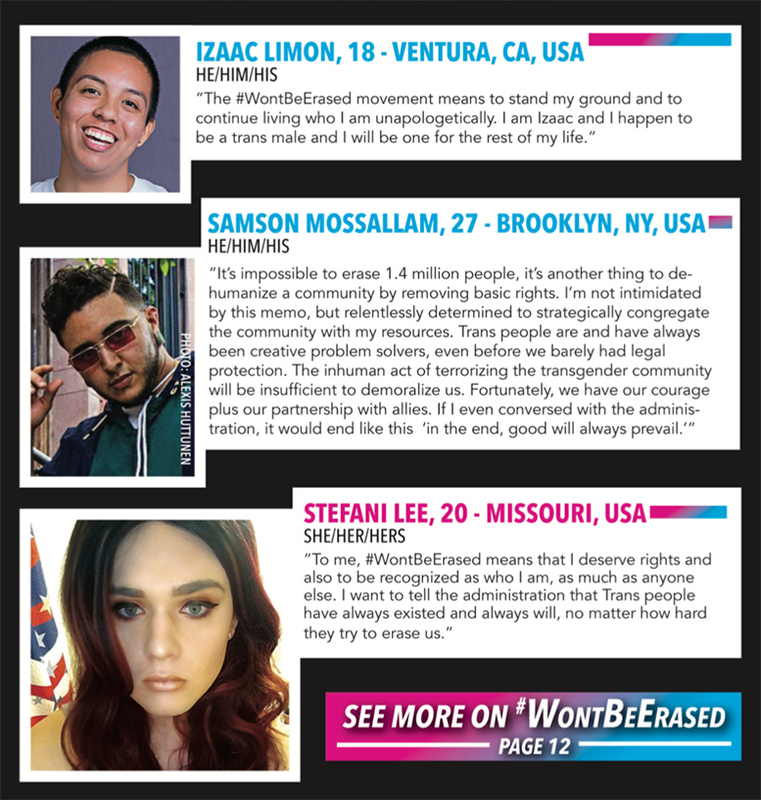 Be the first to comment on "Trans Community Members Talk #WontBeErased Meaning & Message"